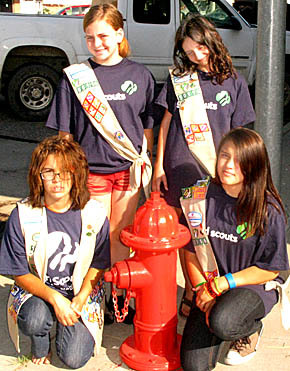 Albion now has brightly painted fire hydrants thanks to Girl Scout Troop 50116. Troop members recently completed a major local community service project by painting more than 100 fire hydrants. They worked toward their Silver Award, the second highest award they can earn as Cadets. Girl Scout leader Sherry Pollock arranged the project with Ron Morearty, city water commissioner.The city provided the paint and tools, and six girls completed the work to earn their community service merit badges. Girl Scouts participating included (front, l. to r.) Amanda Aldaba and Sophia Valverde, and (standing) Hailey Schademann and Codie Bader. 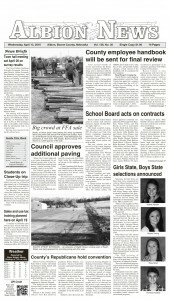 Not pictured are Shelby Bader and Amber Hall, who also participated in the project.